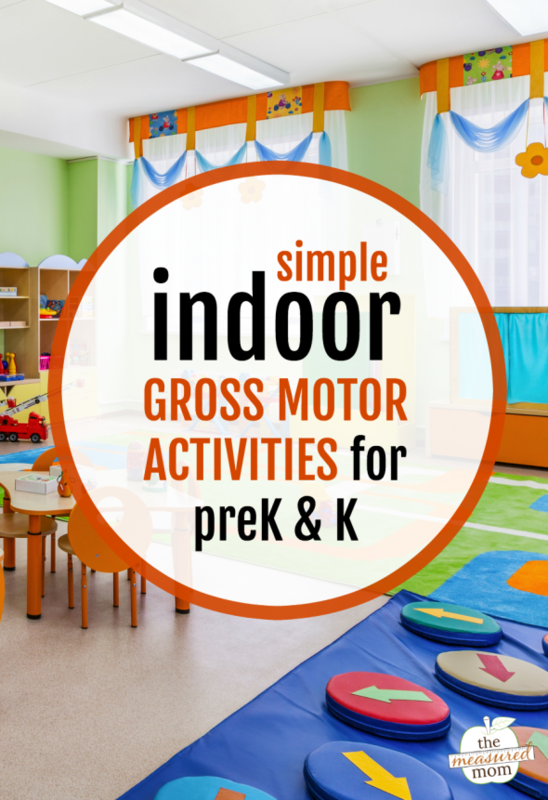 Looking for simple gross motor activities you can do indoors? This is the mega list! I know how the winter goes – whether you’re experiencing it now, or you’re in the southern hemisphere and looking forward to it in a few months. You need things for your learners to get those wiggles out, or you’re going to go a little crazy! Here’s a list to keep on hand! These are perfect for both the home and the early childhood classroom. Provide laundry baskets. Then get your learners in several rows, and have them take turns tossing bean bags into the target. Buy some colored paper plates. Then get creative! Place them in a row (red, green, red, green) and have students step on just the red ones. Or have them get down on all fours and “skate” with a plate under each hand. Put the plates in a row to get your students moving around the classroom. Put the plates far apart for biiiig steps. Or put them close together for tiny steps. If your learners are able to catch a simple toss, put them in a circle. Then think of a way to incorporate learning with a ball toss. For example, you can throw a ball to a student and name a word. Then s/he names a rhyming word and tosses the ball back to you. Toss it to another student with a new word for him/her to rhyme. Painter’s tape is one of the best inventions ever. It goes on (and comes off) easily – whether you’ve got a smooth floor or a carpeted one (but be sure to test it first just to be sure). And there’s so much you can do with it! Put it on the floor like a ladder. Then have students see how many rungs they can jump. Can they jump farther with a running start? See how many rungs they can stretch – or how far they can go on one foot. Need more ideas? Check out this post at Hands on As We Grow. I really think painter’s tape is the way to go on this one. Create a simple hopscotch board with numbers. Then have students toss a bean bag on a space and jump to get there. Another idea is to use cardboard squares that you can pull out at any time. Tip: Change the skill that learners review with hopscotch; instead of putting numbers on the squares, consider letters, shapes, or sight words. Blow up enough balloons for each of your learners (plus extras, because you know you’ll need them after the inevitable popping). Have them put a balloon between their knees and walk like a penguin. Or they can toss the balloon and catch it so that it never hits the floor. Can they balance the balloon on a part of their body (like an outstretched arm) and walk a few steps – or across the room? Print our free alphabet action cards – then get active while reviewing the alphabet one letter at a time. Jog in place while you sing the alphabet. Touch the sky and then your feet five times in a row. Pretend you’re playing the drums. Fly around the room like a bird. For wiggle jar ideas, visit Homeschool Share. This is ultra simple, but surprisingly fun! Grab several rolls of colorful painter’s tape, and set it on the floor in different lines; make the lines zigzag, curvy, straight, or shaped like a circle, square, or other shape.Then challenge your learners to walk each colored line from beginning to end. If your learners like to dance, put on some music – but give them instructions to dance a particular way. They can dance slow, fast, in a circle, silly, etc. Have your learners pretend to do one of these sports. Think of it as heart-pumping charades! Write things your students are learning on sticky notes – they may be letters, numbers, shapes, sight words, etc. Put the sticky notes in various places around the room (some hidden and some obvious), and see how many your learners can find and identify. Sing one of these classic songs, and add some actions! If you have nap mats or towels, pull them out and challenge your learners to do a yoga pose for various letters of the alphabet. For a list of yoga poses from A-Z (and how to do them!) visit Pink Oatmeal. And for even more gross motor ideas, check out 3 Dinosaurs’ gross motor printable list. We hope this list gets your learners moving and saves your sanity at the same time! I cannot get the ONLY18 discount to apply. I typed it in the coupon code. Should I have entered it elsewhere? Unfortunately I forgot to create it until mid morning – sorry about that! It should work now. These are great movement ideas . Thanks! I love your list and will be trying some of these out! We had a long winter last year and wish I would have thought of a few of these then! Thank you for sharing, will definitely use this for my class of 30 preschoolers. Thanks! We sure needed these great ideas to burn off our energy during this spring-delayed weather we’ve been having in Minnesota! Yes – it’s been a loooong winter!! Such great ideas! I would love to know where the round mats with arrows came from! Awesome indoor gross motor activities!!! It is like you enhanced my thought process. Keep doing what you are doing. Thank you!! Thank you so much for sharing. We played “tag” the alphabet. I posted photos around the space with the letter behind it. The kids had a alphabet list to check off (like a scavenger hunt). When they found a photo they: said the letter name, the letter sound, and for extra credit they named another object beginning with that letter. Again, thank you for sharing your ideas! I was looking for an activity for working with my HeadStart children (3-5 year olds) and i LOVE the alphabet action cards, and so did they. Definitely recommend it! I’m so glad you like them, Laura!